[SOLVED] How to create RecyclerView with multiple view type? When we create RecyclerView.Adapter we have to specify ViewHolder that will bind with the adapter. So, is it possible to create RecyclerView with multiple view types? // Set the items from super class. RecyclerView can have any number of viewholders you want but for better readability lets see how to create one with two ViewHolders. In my opinion,the starting point to create this kind of recyclerView is the knowledge of this method. Since this method is optional to override therefore it is not visible in RecylerView class by default which in turn makes many developers(including me) wonder where to begin. Once you know that this method exists, creating such RecyclerView would be a cakewalk. I reformatted my code to mimic this snippet and it now works perfectly. The problem I was having was that on swipe beyond the current page it would crash. Crash no More ! Excellent model,. Thank you . Well done. ViewHolder - it is a simple view holder of recycler view. For more details you can look documentations. It is very simple and straight forward. Just Override getItemViewType() method in your adapter. On the basis of data return different itemViewType values. e.g Consider an object of type Person with a member isMale, if isMale is true, return 1 and isMale is false, return 2 in getItemViewType() method. in onBindViewHolder (VH holder,int position) check where holder is instance of AdapterFemaleViewHolder or AdapterMaleViewHolder by instanceof and accordingly assign the values. Yes, it's possible. Just implement getItemViewType(), and take care of the viewType parameter in onCreateViewHolder(). What is the code in viewholder will look like? Is one viewholder suppose to hold one view type? @GZ95 generally yes, because different view types can correspond to completely different view layouts. ViewHolder is a common design pattern in android described here. Before it was optional to use, now RecyclerView enforces its usage. That's my point since only one ViewHolder is available in one RecyclerView.Adapter how you going to add multiple to it? @GZ95 you can create a subclass of MyAdapter.ViewHolder for each view type. Then you have to cast viewholder type in onBindViewHolder() method which I think it defeat the purpose of generic type. By the way, thank you for your answer. Well, using ListView you would also perform a cast (moreover, you do it even if you have only one view type, so here there is some improvement). To my knowledge, Java doesn't have variadic generics, so they have to use what they have. You can create a BaseHolder and extend it for all required types. Then add an abstract setData, which would be overriden (overrode?) in implementation holders. This way you let the language handle type differences. Though it only works if you have a single set of data that all list items can interpret. 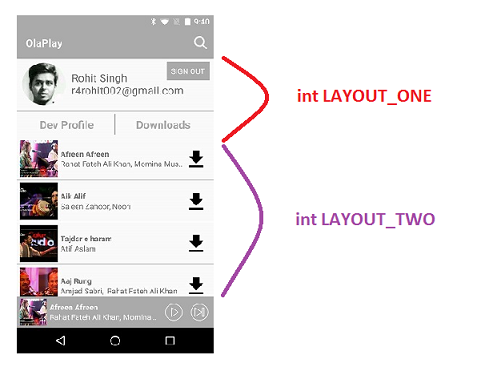 @PratikButani-AndroidButs when you create particular ViewHolder you initialize it with some View which you can create in whatever way you prefer - in particular, you can inflate it from whatever XML layout resource you want. this works fine adding multiple viewTypes but the problem is with the binding data .while scrolling the data changes randomly. @Hemant probably you implemented it wrong. If you have a specific problem, it's better to ask a new question. @AntonSavin: I am facing a related problem ... could you please help me out with my question here ? have you example about 3 or more ? @delive What's a problem about 3 or more? Create appropriate number of view holders and that's it. @Samer, can you explain why ViewHolders should be static? What is the difference between getItemViewType and getViewType? getItemViewType does not seem to be a default method in RecyclerAdapter. @bluemunch I don't understand your question, AFAIK there's no such thing as getViewType() in Android. How about position of onBindViewHolder. For example, view1 has 8 items and view2 has 23 items. Thank you @AntonSavin! I don't understand how can I specify what view has to use a particolar ViewHolder. I mean, I create the adapter passing the layout for the inflate(), I don't understand what the getItemViewType() should get as parameter. How can I say 'if I use the adapter for the recyclerView with id R.id.r1 use ViewHolder0, while if I use recyclerView with id R.id.r2 use ViewHolder1'? @A.Wolf getItemViewType()'s parameter is item's index in the list. It's up to your internal logic to decide what type that item should have. If you have two different instances of RecyclerView you probably will create two different adaptor classes for them, so you implement different logic. My idea is to have only one Adapter for recyclerview which has one image and one textview and i infilate a different layout from the adapter constructor. I want to change behaviour based on that value. I have to do a switch in that method based on resource layout id? The 0 or 2 really confused me at first reading this answer. I suggest simplifying it to returning 0 or 1, use constants, and remove a bunch of the code to make this answer really dead simple to grok at first glance. This works fine adding multiple viewTypes but the problem is with the binding data. How can i fix the random changing data?? I've got 3 viewTypes already defined. following Anton's solution, come up with this ViewHolder which holds/handles/delegates different type of layouts. But not sure if the replacing new layout would work when the recycling view's ViewHolder is not type of the data roll in. onBindViewHolder(ViewHolder holder, int position) is always called when recycling the view (new data is brought in and try to display with that ViewHolder). So when onBindViewHolder is called it needs to put in the right view layout and update the ViewHolder. Is the way correct to replacing the view layout for that ViewHolder to be brought in, or any problem? Appreciate any comment! Edit: looks like in onBindViewHolder(ViewHolder holder, int position) the ViewHolder passed in has been picked up (or created) by looked at getItemViewType(int position) to make sure it is a match, so may not need to worry there that ViewHolder's type does not match the data[position]'s type. Does anyone knows more how the ViewHolder in the onBindViewHolder() is picked up? Edit: Looks like The recycle ViewHolder is picked by type, so no warrior there. Edit: http://wiresareobsolete.com/2014/09/building-a-recyclerview-layoutmanager-part-1/ answers this question. or create new one if not find recycle ViewHolder of right type. throw new IndexOutOfBoundsException("Inconsistency detected. Invalid item "
+ "position " + position + "(offset:" + offsetPosition + ")." + " a view that is ignored. You must call stopIgnoring before"
// Head to the shared pool. Log.d(TAG, "getViewForPosition(" + position + ") fetching from shared "
// do not update unless we absolutely have to. throw new IllegalStateException("Removed holder should be bound and it should"
Actually, I'd like to improve on Anton's answer. Since getItemViewType(int position) returns an integer value, you can return the layout resource ID you'd need to inflate. That way you'd save some logic in onCreateViewHolder(ViewGroup parent, int viewType) method. Also, I wouldn't suggest doing intensive calculations in getItemCount() as that particular function is called at least 5 times while rendering the list, as well as while rendering each item beyond the visible items. Sadly since notifyDatasetChanged() method is final, you can't really override it, but you can call it from another function within the adapter. Yes, that might work, but will make confusing for other developers. Also from Documentation Note: Integers must be in the range 0 to getViewTypeCount() - 1. IGNORE_ITEM_VIEW_TYPE can also be returned. So it's just better to write bit more code and don't use hacks. I agree. Back then i had missed that particular clause. How to use then in an activity? Should the type be passed throught the method? I have a better solution which allows to create multiple view types in a declarative and type safe way. It’s written in Kotlin which btw is really nice. List of such AdapterItemMedium objects is a data source for the adapter which actually accepts List<AdapterItem> see below. Here is an example of this concept : android-drawer-template It goes even further - view type which act as a spinner component, selectable adapter items. The below is not pseudocode and I have tested it and it has worked for me. I wanted to create a headerview in my recyclerview and then display a list of pictures below the header which the user can click on. This is a nice, what if I wanted multiple headers at dynamic positions? Say, a list of items with headers defining categories. You solution would seem to require the special headers to be at predetermined int positions. If the layouts for view types are only a few and binding logics are simple, follow Anton's solution. But the code will be messy if you need to manage the complex layouts and binding logics. I believe the following solution will be useful for someone who need to handle complex view types. The functions needed to define in this class are pretty much same as the adapter class when creating the single view type. For each view type, create the class by extending this DataBinder. In order to manage DataBinder classes, create adapter class. Define the mapping logic between the adapter position and view type. Hope this solution will be helpful. I left more detail solution and samples in GitHub, so please refer the following link if you need. I'm slightly confused by your code, maybe you can help me, I would not like my views to be defined by the positions in the list but by their viewtypes. It appears as if the views in your code are determined based on their positions ie. so if im on position 1, view 1 is displayed, position 3, view 3 is displayed and everything else displays position 2's view. I don't want to base my views on positions but on viewtypes - so if i specify that the view type is images, it should display the image. How can i do that? Sorry, I could not fully understand your question..., but you need to write the logic somewhere in order to bind the position and viewtype. this code is not confused , this is a RecyclerView Adapter pattern, and this should be excepted like correct answer of the question. Follow the link of @yqritc, spend a little time to discovered and you will have perfect pattern for RecyclerView with different type of layouts. newbe here, public class DataBinder<T extends RecyclerView.ViewHolder> can someone tell me what <T someClass> is called, so I can google if I get the term . Also when I say abstract public class DataBinder<T extends RecyclerView.ViewHolder> does that mean that this class is of type ViewHolder, so in result every class that extends this class will be of typeviewHolder is that the idea? @yqritc I have used the library you have mentioned here , I am getting problem with multiple DataBinders , I have posted a question on Stackoverflow .Here is the link stackoverflow.com/questions/33894351/… . Help me plz. Very clean solution. It works smooth and elegantly. @Simon I understood your question. You should create some kind of logic in your adapter class. For instance; you can you position %3 == 0 instead of position == 0. But this might not be enough depending of the size of your dataset for that type. [SOLVED] How to add dividers and spaces between items in RecyclerView? [SOLVED] Why doesn't RecyclerView have onItemClickListener()? [SOLVED] Why is the Android emulator so slow? How can we speed up the Android emulator? Recyclerview with multiple View Types: inner workings? [SOLVED] RecyclerView: how to catch the onClick on an ImageView?